There are different types of managers out in the workforce today. Some managers micro-manage their employees while others take a hands off approach. It is important as a manager to be effective and efficient. 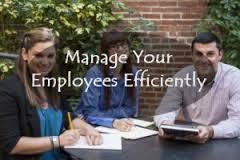 Here are 7 essential tips on how –to manage employees more efficiently and effectively. Give them space – It is hard for your employees to get their work done and to be able to focus if you are micro-managing everything they do. For them to be able to do an effective job, just let them be. Set goals – It is important for employees to grow in their positions and not to be stagnant. By having your employees set goals – either quarterly or yearly, it helps them to stay on track and strive to grow. It is important to communicate what your expectations are for them in their position and what the company would like to see them accomplish in that time period as well. Provide feedback – Make sure that you let your team know when they do a good job, if there is something to be improved, or just to let them know that they are appreciated. Employees that receive feedback tend to be more productive and are happier employees. Be available – Employees may have questions or concerns, and may not want to bring certain things up in front of their peers. Make sure they know that you are available when they need you. Setting up a standing weekly or bi-weekly meeting one-on-one can be great to get a gauge on how everything is going and if anything can be improved. Delegate properly – It is important to get to know the strengths and weaknesses of those on your team. By doing this it makes it easier when passing out assignments or tasks. By giving someone a task they are strong at, it will get done more quickly. Lead by example- Employees do look to their management for guidance. If your employees see you not meeting expectations of the company by taking personal calls all the time, long lunches, dressing inappropriate, or not taking care of tasks – you will find that your employees may start mimicking your behavior as they will take it as a sign it is okay. Behave and work in the manner that you would like for your employees to follow. Remember to have a sense of humor – Don’t be too uptight as a manager, as your employees will find you to be unapproachable.